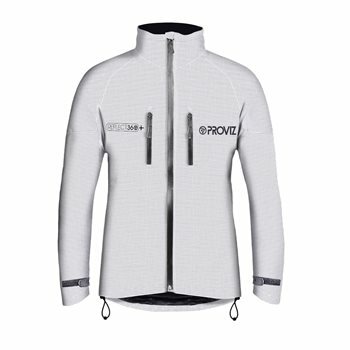 The Proviz REFLECT360 Plus Cycling Jacket is the more ‘technical’ version of the highly successful original Proviz jacket launched in 2014. This new version has been designed using a highly technical film to ensure higher rates of breathability (10,000gm/24hr) and waterproofing (10,000 mm) while not losing any of the incredible reflective capability of Proviz's unique, upgraded reflective material (CE EN 20471 certified) that made the original version a worldwide success and sold in over 40 countries. About the fabric: The material has millions of tiny reflective beads embedded in the material so when a vehicle's headlights hit the jacket, the beads reflective the light back to the light source meaning the driver should be able to identify the cyclist further in advance than normal and manoeuvre appropriately. The fabric used for the REFLECT360 Plus range is designed by Proviz and is highly technical. A brand new film fabric is used to achieve the increased breathability and waterproofing required which is then sealed to our special reflective material. During daylight it is a modest grey colour. At night, when the fabric picks up an external light source, eg vehicle headlights, it gives ‘astonishing reflectivity’ (quote: Cycling Active Magazine). The material is CE EN 20471 certified.